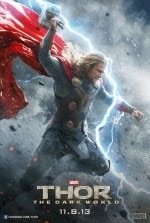 Rated: PG-13 Violence, scary images and some sexual material. SYNOPSIS: Ethan longs to escape his small Southern town. He meets a mysterious new girl, Lena. Together, they uncover dark secrets about their respective families, their history and their town. REVIEW: Richard LaGravenes, screenwriter of Water for Elephants and The Horse Whisperer, and director of P.S. I Love You, directs and writes the adaptation from the supernatural young adult romantic best-selling novel by Kami Garcia and Margaret Stohl. Ethan Wate (Alden Ehrenreich, Tetro) is a banned book bookworm who is also perky and popular. He loves Kurt Vonnegut's 'Slaughterhouse-Five', William . Burroughs' 'Naked Lunch', and Stanley Kubrick's A Clockwork Orange. He dreams of leaving the small-minded and backwater Gatlin, South Carolina, to discover himself and the world before he decides on who he is. During the start of his junior year of high school, a new girl comes to town and to school. Lena Ravenwood Duchannes (Alice Englert, Ginger and Rosa) comes to school as an instant outcast, coming from a long line of rumored satanists and devil worshippers. The other girls make jokes at Lena expense and shun her, but Ethan finds her a kindred spirit and does not take part in his classmates' verbal abuse. When a chance encounter on a deserted road takes Ethan and Lena to her Uncle Macon Ravenwood's (Jeremy Irons, The Words) plantation doorstep, Ethan finds himself more intrigued and enchanted by Lena with every moment. The pair gets closer because of Ethan's gregarious nature, and in spite of Lena's misgivings, prompting her to reveal to Ethan of the fact that she is a caster - a witch with powers beyond that of mere mortals. What's more is that she tells Ethan that she has until her sixteenth birthday until she is confronted with the inevitable Claiming that will decide whether she will become a dark caster or a light caster. While Lena is desperate to stay in the light, her mother Sarafine (Emma Thompson, Brave) Disguised as the town conservative christian Mrs. Lincoln, Sarafine and Lena's cousin, dark caster siren Ridley (Emmy Rossum, Shameless) who was previously lost to the dark, plot an elaborate scheme to ensure that young caster Lena is taken by the dark. Can Ethan's love for her saver from the dark or will he only ensure that she succumbs to it? The adaptation of the first book in the best-selling series by Kami Garcia and Margaret Stohl, Beautiful creatures will appeal to fans of The Twilight Saga and other young adult supernatural infused stories. For me, Beautiful Creatures is altogether different than what I expected - for the better. Set in the southern swamplands of Gatlin, South Carolina, lore for Richard LaGravenese uses the story's southern charm to enrich an already spicy story. The people of Gatlin openly cast aspersions to those who they deem as outcasts. Where Edward, Bella, and Jacob seemed to hide in plain sight with no one none the wiser, the setting of the South uses it's lore to make the idea of witchcraft and devilry center stage among those in the community. Appealing to tweens and young adults, this supernatural love story is refreshing and fun. One of the decidedly different aspects of this film is that it seems a little more intelligent than what we have come to be used to. Sharp and witty, the dialogue is a great asset to the film. Sure kids may not talk that way but Ethan's use of the language is both gripping and fun. Where I was never a big fan of Kristen Stewart as Bella, I thoroughly enjoyed Alice's Lena. Jeremy Irons brings great Southern hospitality and charm as Lena's uncle and protector, Using an accent similar to what he used in Die Hard with a Vengeance, just with a little less Texan drawl. Emma Thompson's Sarafine excels as the demure Christian housewife and community leader possessed by one of the most evil and powerful dark casters alive. Rossum's cousin Ridley just wants to dark cast and have some devilish fun, as well as being a bubbling henchman to Sarafine's schemes. And Viola Davis as Ethan's housekeeper Amma may know more than what she is letting on as she struggles to walk the razors edge of helping versus hindering. The costumes, set design, and special effects suit the film well, used in just the right amount to enhance the story of a young witch and her first true love. From the foreboding exteriors of the Green Briar plantation, to the hyper-modern interiors of Macon's home, from the spell casting of Lena and Sarafine's, to a spinning dining room, from civil war re-enacters to Lena's party goers for her claiming party, LaGravenese and his team make great use to visualize the source materials. 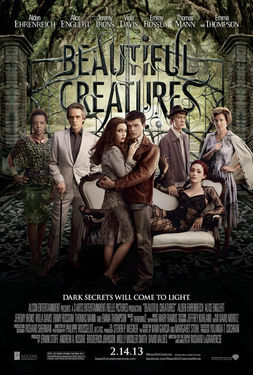 Beautiful Creatures is a fine example of a young adult supernatural romance that works on all levels. From perfect casting, to wonderful set design, to quaint and effective use of the South, Beautiful Creatures breathes fresh life into a genre already filled with werewolves, vampires, and zombies - oh my!